.NET Standard and .NET Core have been on my mind for a long time now - years really, but the reality is while I've been using the technology quite a bit, I've not jumped in with both feet. In fact, to date I have yet to build anything 'real' for customers beyond a few internal infrastructure projects and quite a few sample applications. For me personally, .NET Standard 2.0 and .NET Core 2.0 with their much bigger base library foot print and the real possibility of porting the majority of existing library code over to .NET Core really has been a deciding factor for me to start moving some of my existing full framework libraries that I've been using for as long as I have been using .NET to .NET Core 2.0. Being able to bring some of the tools I use to be productive over to .NET Core is actually pretty important factor to overcoming my reluctance to move into .NET Core. Nobody wants to rewrite code they already have just to get back to square one, but with .NET Core 2.0 it really looks like most code will migrate pretty easily. This isn't just important to me personally, but I think this is a vital requirement for moving much of the support libraries that exist for .NET into .NET Core and providing the full featured eco-system that we've come to expect from .NET applications. Currently with .NET Core 1.x it's been hit or miss feature wise to feel confident you can actually make it through a project without getting stuck with some missing core feature you can't easily find and have to build from scratch. My feeling is that .NET Core 2.0 will change all that by making it possible for most libraries to be ported with minimal effort. In this post I describe porting an existing full framework library to .NET Core 2.0 and multi-targeting the project to support .NET 4.5, 4.0 and .NET Standard 2.0. The porting process was even easier than I expected, although the tooling required a bit of patience to get on with. Note that currently there's no support for .NET Core 2.0/.NET Standard 2.0 in the release version of Visual Studio, and that's why the Preview install is required. You can install the minimal .NET and .NET Core payload for a lightish install, and the install is side by side with Visual Studio 2017 RTM so both work. A key concept to the porting process is .NET Standard 2.0 and how it relates to .NET Core 2.0. For those of you that don't know, .NET Standard is a specification that serves as a blue print for .NET runtime implementations. The standard specifies what base features the runtime has to implement to support it. .NET Standard describes the base API library - what we used to think of as the Base Class Library (BCL) in full framework that make up the core features of the platform. .NET Standard is a standard not an implementation and it's up to the runtime to implement the features set forth in the standard. The logistics of this involve some runtime magic where each runtime provides a set of .NET Standard forwarding assemblies that map the .NET Standard APIs to the actual underlying APIs on the specific runtime. For the purposes of this discussion, the salient point is that .NET Core 2.0 is an implementation of .NET Standard 2.0 which means that if I implement a .NET Standard 2.0 compliant DLL it will run on .NET Core 2.0. And any other platform like .NET 4.6.1, Xamarin, Mono, UWP and Unity all of which will eventually support .NET Standard 2.0. By targeting .NET Standard 2.0 I can insure that my DLL will run on any of the target platforms that .NET Standard supports. The big win with .NET Standard is that it provides a common interface to consumers of a library, as well as an official guideline to the actual runtime implementers. For Visual Studio purposes targeting .NET Standard for a class library is also what gives the new SDK project type that is required to make multi-targeting work. I don't want to rehash all the details about how .NET Standard works here, but you can read my earlier blog post .NET Standard 2.0 - Making Sense of .NET Again for a more detailed discussion on just how that works. The key takeaway for this post is that your .NET Applications can now target .NET Standard 2.0 in your class libraries (or applications) and can have a very reasonable expectation of interoperability for a number of platforms. In this post I'll talk about full framework .NET 4.5, 4.0 and .NET Core 2. To really put this all into perspective I decided to move one of my libraries - Westwind.Utilities - to .NET Core 2.0 and in the process target .NET Standard 2.0, .NET 4.5 and .NET 4.0 all in a single project. Multi-targeting from a single project is an awesome feature that makes it possible to create a single .NET library project that can target multiple .NET Framework targets. Using a single project I can create binaries - and a NuGet package if desired - for multiple platforms. Westwind.Utilities is a really old project that I've been using since the very early years of .NET and it's interesting in this context because it contains a large hodge-podge of functionality that touches a lot of different framework features in a single library. If I built this today I would probably have broken most of the features out into separate projects, but there's a lot of convenience in having these features I use in almost every project provided in a single package. Anyway, the point is this is very typical full framework legacy .NET code that was designed with no concept of .NET Core and makes a for a good example of what you're likely to find when you start porting full framework code to .NET Core 2 and later. This creates a new SDK style project using a csproj file. This is the new, more streamlined, MSBUILD based project format that uses the underlying dotnet command line tooling to build, test and publish your library. These projects can also target multiple runtime versions, and when compiled, output multiple versions of your assembly for each runtime. You can also optionally publish and create a Nuget package that includes all runtime versions. The new SDK format lets you configure NuGet attributes directly in the csproj file configuration. I also set up a test project at the same time to move over the existing tests for the old project. Notice the three targets for .NET 4.5, 4.0 and .NET Standard 2.0 all living in the same project. You can also see the dependencies that each of the different runtime implementations are pulling in. .NET Core only shows the two packages (Json.net and SqlClient) I pulled in, while .NET 4.5 shows the specific assembly reference - both explicit assemblies and dependent assemblies (the ones with the lock in Solution Explorer). The good news is that you can now have a single project with multiple targets with one single build step. Yay! The bad news is that there's currently no visual tooling support for managing multi-target projects in Visual Studio and you have to deal with the .csproj file directly to change targets or apply special target configuration settings. Yup - no runtime target shows because the UI can't handle multiple frameworks (it only looks at <TargetFramework> not <TargetFrameworks>). In order to manage multiple frameworks you currently have to work directly with the .csproj file. The new .csproj format no longer explicitly needs to add every file to the project. Code files are now implicitly considered part of the project and so no longer need to be explicitly included in the project which drastically reduces the size and complexity of the project file as well as reducing the change churn in the file which is better for source control management. There are still overrides that let you specify custom behaviors for specific files or add files that need to be explicitly included or pushed out as content into the build folder. But for your base code files, they are considered included by default unless you tell the project otherwise. 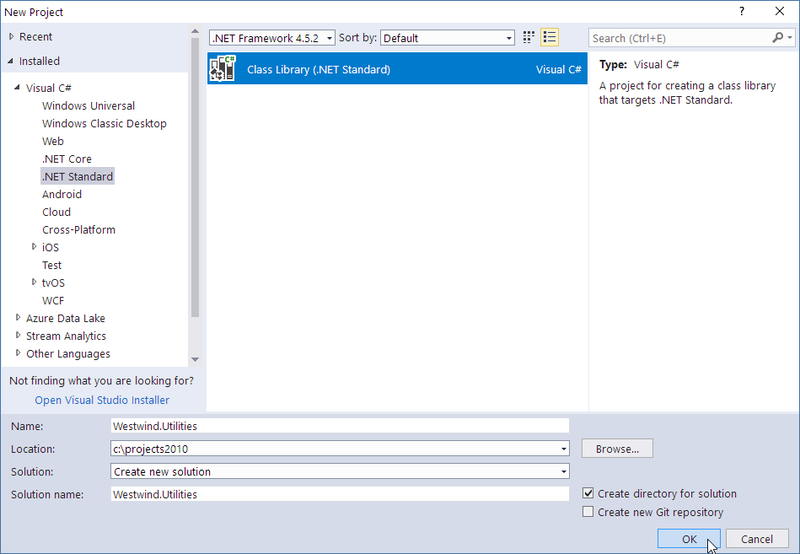 You can now easily edit the .csproj file from Visual Studio while the project is still active. Most changes are immediately reflected in Visual Studio although in the current preview that behavior is still a little spotty and some things require an explicit project/solution reload. Et voila: I now have project that compiles for 3 separate targets! You can find a list of target frameworks available in the .NET Platform Guide. Here I'm targeting .NET Standard 2.0 for my .NET Core 2.0 applications and standard .NET 4.5 and 4.0 for the full framework libraries. Note that if your library can work entirely with .NET Standard and doesn't need any additional features, you can potentially just target a version .NET Standard, but if you're migrating from full framework you're probably better off just creating separate full framework targets alongside the .NET Standard target. As shown in the project above Visual Studio automatically breaks out the different runtime dependencies and you can manage those in Visual Studio, but they are also referenced in the .csproj file. It's relatively easy to set target specific build and configuration options. The following shows some of the settings I use for the .NET Standard 2.0 and .NET 4.5 targets (omitting the .NET 4.0 ones which are the same as 4.5 except for the name). The key items here are the runtime dependencies which are NuGet packages for .NET Standard and explicit assemblies and Nuget packages for the full framework versions. There are also custom compiler flags that are set up, which I use in the project's code to differentiate between .NET Standard and Full Framework features so I can conditionally bracket code. Typically I use NETFULL and NETSTANDARD to differentiate between the two different paradigms and the specific version specifiers like NET45 and NETSTANDARD_20 which coincide with the standard .NET Framework monikers. Unlike in older versions of .csproj files the above is easy to read and understand, so modifying the .csproj file manually shouldn't be a big deal. I also presume that at some point Visual Studio will support setting up configuration for multiple framework targets interactively probably with a frameworks selection dropdown instead of the single value. Note that although you have to deal with framework specific settings using the .csproj file, all project wide features can still be set up through Visual Studio's IDE. So if you add special attributes to files (like content files to copy in a test project for example) those features still work from Visual Studio and update the .csproj file for you. It's just the top level target features that are not available in VS right now. Let's get back to the actual migration of my project. Because I am essentially creating a new project for this library, I have to move the old files into the new project. The process is to simply move the files/folders from the old project into the new. Because you no longer have to explicitly include files into the new SDK project, there's no need to perform an explict Include File step. I can simply copy files from the old project and they will just show up in the new project. Because this library is not very feature focused, I decided to move small, logically related chunks of the project at a time in order to not get overwhelmed by the migration errors I was likely to run into. In this case I started with several of the the independent utility functions which are freestanding. I used the StringUtils class and it just ported without any issues. Because the features used in these utilities are based on core runtime features no changes are required and they just compile and work. Starting with these allowed me to get the project up and compiling for all runtimes, making sure that the cross project compilation works and that the NuGet package generation works. The good news is that a large swath of the library falls into this category. As I pulled in new pieces of the library, about 85% of the files imported required no attention at all - .NET Standard's larger foot print lets me reuse the majority of my code as is. The rest required some conditional logic that either removes functionality or uses different logic to implement the same functionality. More on that in a minute. netcoreapp2.0 targets a specific version of the framework rather than .NET Standard which is currently necessary for top level execution frameworks (console apps and test runners). Once I got through the obviously basic files that I knew would port, I started importing some of the more involved components, knowing full well that I was going to run into compatibility problems. This include those that use System.Configuration (which isn't support in .NET Core and which is the biggest pain point for me), a number of System.Data and System.Data.SqlClient issues, and a few odds and ends here and there. When porting code from full framework .NET to .NET Core you are likely to find a APIs that aren't available or behave differently, so there will be some conditional code you need to write to ensure that code is handled properly. Either way this takes the form of using a compile time constant to bracket code or completely removing code that just isn't going to be available for .NET Core (or full framework in the reverse case which is likely rare). This code assumes that non full-framework code feeds a fully qualified connection string rather than a ConnectionString entry while full framework code can continue to use the connection string value. In .NET Core the encryption key has to be the exact size (24 bytes) where in Full Framework the key was allowed to be 16 bytes. On full framework the key was fixed up by duplicating the first 8 bytes to fill to 24 bytes, but on .NET Core that same process does not work. So I have to explicitly provide the larger key. This is a behavior change and in fact causes some interop breakage because the key hash algorithm changes which in term breaks the two way encryption. But at least with this code it's possible to now use 24 bit keys both on full framework and .NET Core. It'd be reasonable to eventually update ImageUtils to either of these libraries, but at the moment that seems like low priority. Backwards compatibility for full framework is preserved, and on .NET Core it's probably a better idea to just use ImageSharp going forward as it provides - unlike System.Drawing - a relatively simple API to perform common Image Manipulation tasks like resizing, rotation and converting of images that is provided by ImageUtils in the first place. Then there are some Windows specific features in the library: A handful of ShellUtils that open documents and browsers, a few Windows security related utilities which also don't work with .NET Core and aren't supported by .NET Standard. These are treated the same way as ImageUtils by bracketing them out for .NET Standard. All in all though there's very little code that required special handling using any of these approaches. Most of the original .NET 4.x code is happy as is when targeting .NET Standard 2.0 which is a huge improvement over previous .NET Standard Versions. Here the RetrieveConnectionStringInfoFromConfig() function does exist on the netcoreapp2.0 (in a test project here) target, because the implementation simply brackets out the code to read the connectionstring from the config file. which is quite helpful in tracking down missing APIs or finding places where you own code is using features you may have removed for .NET Standard. As you've seen, you're able to target multiple frameworks, but since Visual Studio has no direct support for it there are a number of issues that you need to deal with in - less than optimal ways at the moment. uses .NET Standard 2.0. This means in code any of the netstandard2.0 constants will be applied, and unit tests (netcoreapp2.0) will run using that target. Whichever framework is first is applied. You can see that the conditional block is not included as NETFULL is not set. Because SDK Projects are using the .NET command line tooling you can also build, test and 'package' your application from the command line using the dotnet command. so you can pick and choose whichever approach works best for you. 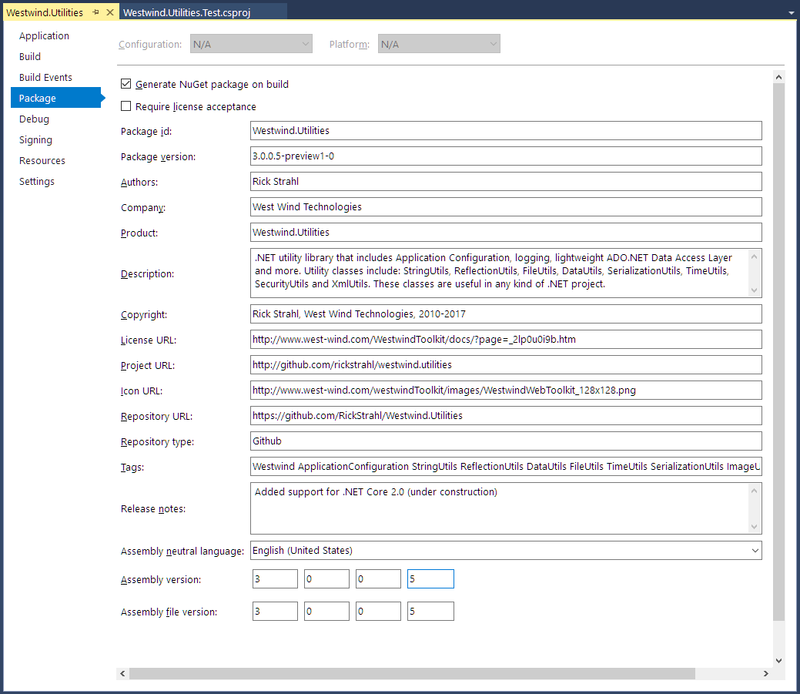 The resulting package is ready to get pushed to a NuGet repository which is really nice. As mentioned above you can only target a single framework at a time in Visual Studio and in order to switch the test single target you have to change the order of framework in the TargetFrameworks. If you want to run all tests for all platforms at once you can run them from the command line. which runs all tests for all framework targets. where the framework parameter matches one of the test targets. The dotnet test command lets you also specify specific tests by passing a test class or test class and member filter using the fully qualified type name. Right now the command line is the only way to run multi-targeted tests, but again I think Microsoft will likely bake this into Visual Studio eventually, hopefully before .NET Core 2.0 and the next round of Visual Studio Updates ships. Whew - this turned into a longer post than anticipated. There are a lot of details in relation to running applications this way and while there's some manually management of the .csproj file require, I can say that easily beats the headache of having to maintain multiple projects for each target with class .NET projects. The multi-targeting features make working with multiple targets a breeze and the fact that the build can also produce a final NuGet package is an extra bonus. If you plan on playing with this stuff, make sure you use Visual Studio 2017 Update 3 Preview 2.1 or later. There were a lot of problems with earlier builds and performance was absolutely terrible. Preview 2.1 which landed just a few days ago I think, improves performance and finally makes multi-targeted tests work for all targets (although still no support for testing multiple targets all at once). The tooling is not quite there yet obviously but I think that's to be expected given that the functionality just has been implemented recently - the new SDK projects are still relatively new and there are still many new features hammered out for .NET Standard 2.0 - Visual Studio is slowly catching up. It takes a little extra effort dealing with the .csproj file, but with the new format this process isn't anywhere as daunting as it used to be. I noticed you're using ConfigurationManager there. There is currently a preview build out for System.Configuration.Configuration manager for NetStandard 2.0. Have you tried to use it at all? I'm getting an error complaining that ConfigurationManager is found within multiple namespaces after adding it, despite having removed all references to the System.Configuration assembly. Anyway wasnt sure if you had any ideas about that. @Will - I haven't used it but I suspect you need to ensure that the package is added only to the .NET Standard target not the full framework ones since those have it as part of the System.Configuration reference. What a coincidence, I have been thinking about writing a similar post for some time now. Great post! 😃 I just wanted to point out that in VS 2017 you can actually change the target framework from Visual Studio in the dropdown just below the tabs with open files. @Stefan - you can change the target framework, but only if you have a single target. If you target multiple frameworks it doesn't show anything (because the UI wouldn't work for that). @Stefan - I'm using the .NET Core 2.0 SDK Preview tooling and VS 2017.3 Preview 1. Perhaps you're using current release of VS 2017 and perhaps with a project.json rather than the SDK tooling? I'm not sure all I can see is that it's not working and when asked that came back as a known issue at the moment. 2017.2 and the older SDK here so maybe it hasn't been added to 2017.3 yet. "The bad news is that there's currently no visual tooling support for managing multi-target projects in Visual Studio and you have to deal with the .csproj file directly to change targets or apply special target configuration settings." is a bit confusing though as it does work in older versions and is probably just a bug in the current version. Just wanted to point that out. @Stefan - Maybe it's just for .NET Standard 2.0 projects since that's a new SDK. I didn't check for .NET Standard 1.3 and earlier which are 'released' SDKs. Thanks you for this information Rick. I was looking over the Cake project and this really cleared things up for me with regarding to multi-framework solutions. @Rick - You and Stefan are talking of different things (look at his screenshot): he is talking about the dropdown box inside the editor while you are talking about the target framework dropdown box on the project property page. @Felix - that dropdown only controls what you see in the editor, not what the project is actually using for compilation. It's useful as you can edit code and see the appropriate Intellisense and error information in the editor, but it won't affect the build process for example when running tests. For example, try changing the dropdown and then run a test that steps into code - if the platform specified in the .csproj file differs it'll always use what's in the .csproj file. Painted myself into a corner and have just found your article. Implementing legacy W/S with the associated DTO's & POCO's that NEED to come with the W/S. What a nightmare .core debacle. Finally somebody actually saying the elephant in the room that as you pointed out it was unusable in a real world enterprise scenario. @Rick, have you ported an MVC Core Project to 2.0 on the full framework yet? I can't seem to find the right settings .csproj configuration to get Microsoft.AspNetCore. * libraries to install and still have access to the full framework to use SQL Reporting Services. This was all oworking very nicely using 1.1 on a full framework configuration. @Rick, great post (sorry I'm late to the party). I've been in the process of porting several of my libraries to .NET Core and I had been struggling with the idea of doing multi-targeting. In any event, your post was incredibly informative and I was able to breeze through a couple conversions relatively smoothly. Invariably, I've run into the myriad of things that we "depend" on that aren't available under as nuget packages and have made adjustments. Thanks a bunch! I am able to set multi target frameworks as .Net Framework 4.6.1; Dot net Core 2.0 and Dot net Standard 2.0. After build I am getting 3 different DLLs. I am getting problem to make the CI-CD for the class library Application to make Nuget Package which I have set as Multi Target Framework. What has kept me from deploying .net Core apps for customers is my lack of knowledge of how to do it in a windows service. Has anyone found an easy way to do this? It rarely gets talked about for some reason. Thanks Rick, this was very straightforward and helpful and I wish I would have found it much earlier in my journey here than I did! At least I learned a few more things chasing down alternate paths! Hey Rick -- so helpful! I've been wanting to convert my CommonFramework libraries to .NET Core and typically got waylaid by the effort and other demands. .NET 2.0 supports so much more and now what you've described in this article for multi-targeting, I got my main library converted over and usable in other projects within a matter of hours. You hit everything I needed to get going quickly. I love the multi-targeting vs using a .NET Standard library in a .NET Framework project -- it's exactly what I wanted to do. Thanks again. P.S. We met MANY years ago when I worked for PrimePro Data in North Canton. I think you were brought in for some FoxPro consulting at the time. I've casually followed your writings since then and have gleaned many useful ideas. Thanks for your contributions to the .NET community over the years! I need to port in a standard System.Web.Services.Protocols.Soap library, but it is not compatible, what can I do? Thanks for a great article! I have a dotnet standard 2.0 class library that will be shared between core & 4.6.1 applications. 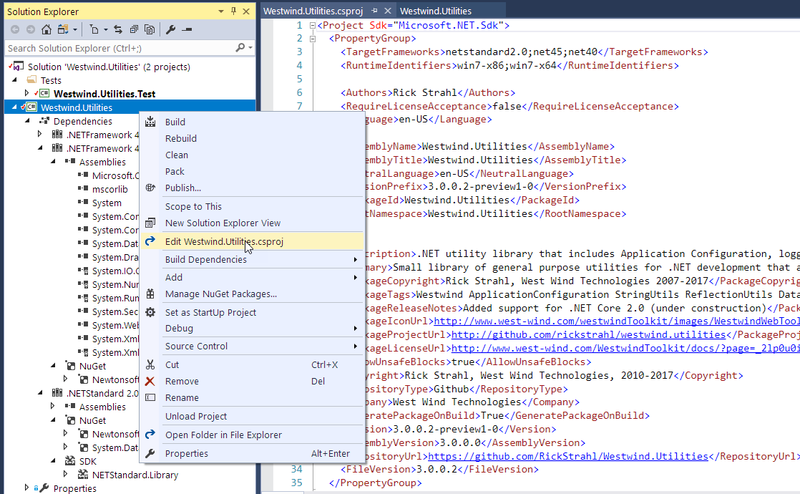 Have you setup a VSTS build to build, publish & nuget pack for both the targeted frameworks? @Mani - yes, the Nuget Packaging happens automatically if you have a multi-targeted project set <GeneratePackageOnBuild>true</GeneratePackageOnBuild> in the project file. It'll automatically create a Nuget package for all the targets you include in the project as described here. Is it possible to change the name of the DLLs by putting the framework version at the end (Ex: myconectionNet471.dll) and generating all in the same directory? You know I'm not sure if you can change the name of the assembly in an SDK project. I think the project is what determines the output of the package. You could however rename the file after build and that should work - there's nothing magical about the file name as it's just a container for the binary module. I did the following to solve my problem. I've been fiddling with this for days, I couldn't figure out how to add reference assemblies to full framework. I was doing the obvious, Right Click - Add Reference but the UI doesn't work. Needed to read this post and learn how to hand write the proj file. I think this post is slightly out of date now? VS2017 creates the constants like NETSTANDARD and the full framework Dependencies' Assemblies are automatically populated, I only had to add optional ones. Bug: NuGet's upgrade doesn't work, it tries to install the package to all the Dependencies. Just use text editor to edit the version numbers. Finally, fairly O/T question. Does System.Transactions work in netStandard1.x or 2.x? If not, anybody know why? I'm guessing because it's too much to ask framework developers to implement something that automagically ties SQL Server Transactions, MSDTC Transactions and NTFS Transactions.